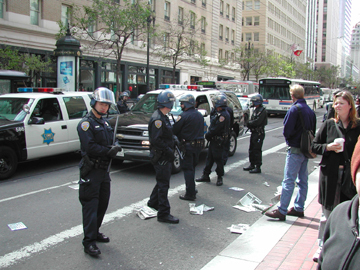 Attached photo's taken outside 525 Market St around 9:00am on March 20th 2003. As I arrived at the office at 7:00am, demonstrators were gathering on the sidewalk and just as I walked past (coincidence I am sure!) they all rushed out into the street to block it. It was a coordinated effort, as I understand they have taken over several other intersections around San Francisco at the same time. The picture to the left is the view from 30th floor looking down on the intersection. The two buses are trapped between the rows of demonstrators - one set at the lower half of the pciture (in the shade) and the others in the top left. Next to the bus in the middle of the picture are the first of many police vans to arrive. The picture to the right, again from the 30th floor, shows a closer view of one of the trapped buses and the arrival of the police (lined up around the bus). You can see the demonstrators across the street and congregated on the sidewalk. NOTE: To those in England who are receiving this, I apologize for using the American spellings and phraseology (e.g. sidewalk for pavement, apologize for apologise) but I had to pick one language as I really can't be bothered to do this twice! The police set up a corral ... made up of normal police barriers on the widest area of sidewalk. 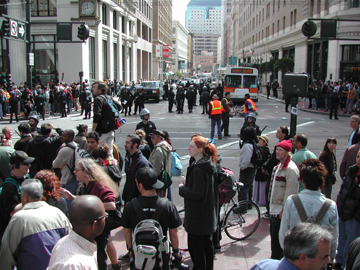 Seen here in the middle of the sunny area of the picture, the corral was used to hold the "arrested demonstrators". The police were cuffing them using nylon ties, and then leading (or carrying) them to this area. As time went on the corral expanded to about 5 times this size! The picture on the right is taken from right outside our office, 525 Market Street. You can see the demonstrators lined up across the street effectively blocking all traffic. Look carefully and you can see demonstrators lying on the ground, waiting to be arrested. Taken over the viewers heads, the police and fire department are attempting to clear the demonstration. Look carefully and you can see a few people being led away, along with the fire department (with circular saw) preparing to remove some more handcuffs. Once arrested, they were led to the "corral". Most people on the sidewalk are simply watching ... many whilst drinking their morning coffee. A few pro-war people also around .. one of the most innovative shouting "Thank you anti-war protestors ... all the police overtime you are forcing is taking money away from nursing! We have enough police, enough bombs and a big enough army. Let's spend more money on our own people and stop wasting it here". He was soon shouted down! As the police and fire department continue to move the demonstrators, look to the middle left of the photo and you can see the top of a tuba. About 40 of the demonstrators turned up with musical instruments and attempted ( loose usage of the word) to play various songs. One of my colleagues chose an unfortunate moment to walk past the demonstration, and arrived in the office with the following quote "People who don't speak French should NOT attempt to sing "La Marseillaise". Probably my favorite (yes, there is that American spelling again!) picture as the fire department and police department figure out what to do next. You can clearly see the demonstrators lying in the street, blocking it totally. You can also see the muni tracks ... although buses, taxi's and cars were being diverted the F-Line railway was totally halted. As of 9:20am, 2 hours after this started, I look out of the window and see that the police almost have the street clear. Not quite in focus, but given that I was holding the camera high above my head it wasn't easy! Photo shows the fire department with red circular saw removing the handcuffs that he demonstrators used to chain themselves across the street. It was all remarkably peaceful (to this point), but as you will see below, the police don't necessarily expect it to remain that way. As I returned to the office, took this photo right outside the building. The policeman is busy preparing yet more nylon handcuffs. "There are too many of them-we can't win"
"There are some trouble causers beginning to gather - look at the guy over there in all black - those are the guys we're watching"
"They are all over the city. They tried a couple of times to get the Bay Bridge but that won't happen unless we make a mistake"
"BART won't put up with it ... they will keep them off the trains"
"Muni drivers just stay out of the way ... they have a rotten job and they won't do anything to put themselves at risk"
He is in for a long day, but was in good humour (my one concession to English spelling!) and quite happy to chat. At 3:00pm, our office was officially closed due to notification that the demonstrators were going to attempt to disrupt the evening commute. I am therefore updating the website on a BART ride home, and including pictures from a lunchtime sortie to a local Indian Restaurant (Naan'n'Curry) for a very good lunch and some more close up views of demonstrations. 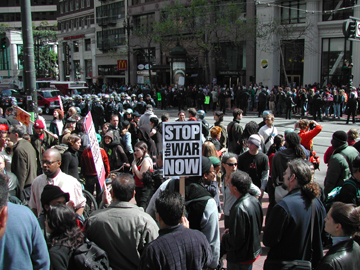 It is safe to say that the demonstrators have been very successful today in disrupting the financial district of the city of San Francisco. They have effectively closed Market Street most of the day, and have caused disruption in many other areas. BART itself had to stop trans-bay service for a while due to some teenagers throwing rocks at trains, and in a number of places there have been incidents of vandalism. For the most part though, the demonstrations have been peaceful but noisy, and at no stage did I feel at all unsafe. The police too have been generally good natured - at least where I saw them. As you can imagine, the threat of an aircraft collision over the city is probably the most significant risk today. 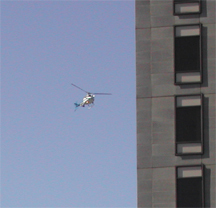 At times, other than the police helicopters, I have seen up to 4 news helicopters and 3 news aircraft. As we left for lunch, the demonstrators were just being cleared from the junction of Market and Montgomery. This was probably the largest concentration of demonstrators that I saw all day, although it was difficult to note who was a demonstrator, and who was a passerby....evidence, to those in DFS IT, of the passerby status of some in the photo can be ascertained by looking carefully at the gentleman in the bottom-right (trying to sneak out of shot) of this photograph!!! The size of the crowd, and the numbers of police, can be seen in this shot looking down Market towards the Ferry Terminal. The photo is taken from the steps outside the entrance to Montgomery BART station. As stated before, even with this many people, you felt reasonably safe at all times. The police plan, once the road is clear, is simply to keep everyone on the sidewalk. This is just prior to Market Street being reopened, and as you can see the police are ready and waiting for people to try and block the road again. Similar shot, looking back down Market. 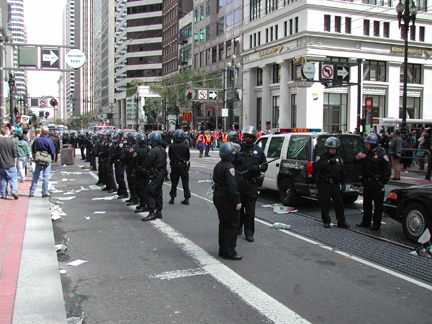 The police were deploying rapidly, but were severely outnumbered. This is now around 1:00pm, and Market Street had effectively been closed for 6 hours. It MUST be San Francisco. 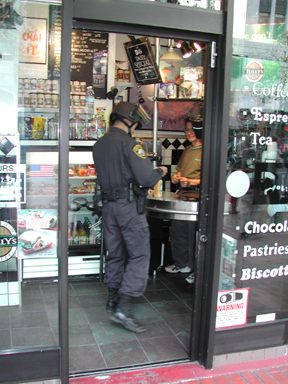 Full riot gear, armed, helmet on .... Can I have an "non-fat extra hot latte please?" Unfortunately I couldn't get him to turn for the shot....the funniest part is that behind me was a police truck full of his colleagues (similarly attired) and shouting at him to get a move on! I wasn't the only person wandering around with a camera. As we walked back from our curry, this policeman appeared (from another coffee shop!) and headed back towards the crowds. 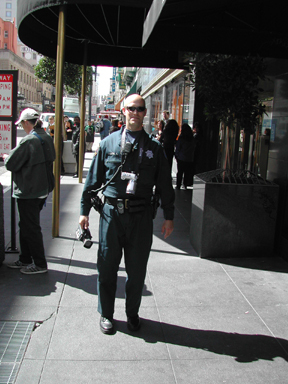 Armed with his riot gear, digital camera and camcorder, I would think that he also put some good photo's out on the web. As always, when I take photo's of people I ask them if they mind. I would like to thank all the police who had absolutely no problem providing photo's, and were very friendly in answering questions.